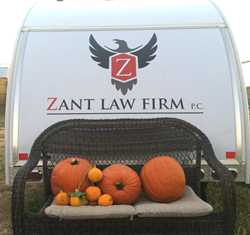 In light of fast-approaching Halloween, Alexandria Zant, of Zant Law Firm P.C., discusses premises liability for homeowners decorating for the holiday and how to avoid visitor injury. However, with numerous people stepping foot on your property, the chance of injury greatly increases and homeowners need to take precautions to avoid this and potential lawsuits or costly homeowner’s insurance claims. According to NOLO, premises liability comes into play in personal injury cases where the injury was caused by some type of unsafe or defective condition on someone’s property. Having a porch light on and Halloween decorations out could be found to be an implied invitation to would-be trick-or-treaters to enter the property; therefore, the trick-or-treater would not be a trespasser even if the homeowner tries to argue they did not intend to pass out candy or invite anyone to their door. For this reason, Zant suggests keeping your driveways and walkways reasonably well-lit to lessen the chance of injury. Additionally, if your house is under construction that is near the walkways or in any way impedes your walkways, you should consider not passing out candy this Halloween as the younger trick-or-treaters could be apt to play with or pick up anything left behind from the project, such as tools, nails, stakes, etc. Zant also stresses that having a costumed individual jump out from some dark corner, despite keeping with the spirit of Halloween, is not advisable. About Alexandria Zant, Zant Law Firm P.C. Attorney Alexandria Zant operates the county’s only mobile law office, making house calls to her clients. Her areas of practice are auto accidents, injury at a store or business, daycare injuries and workplace injuries. Her physical office is located at 1444 Montana Ave., Suite 101, El Paso, TX 79902. For more information, please call (915) 799-0993, or visit her Google+ page.